A taxpayer identification number (TIN) is a unique identifier for a business, employee, or contractor that can be used on US government tax forms. Many people already have a tax ID number in the form of an employer identification number (EIN) or Social Security number (SSN). Having a TIN allows a business to obtain a business license, get a business bank account, or apply for financing. Once your business has a TIN, you can use it to open a business banking account. We recommend Chase for business banking due to their large network of over 5000 locations, low fee structure, easy-to-use website and great mobile app. TIN is the blanket term that includes all the various kinds of tax identification numbers that a US or foreign-based business, sole proprietor, or individual taxpayer may have based on their tax status. Employer ID numbers (EIN) and Social Security numbers (SSN) are common types of TINs. Most US-born employees use an SSN for their tax return, whereas businesses tend to use an EIN. Sole proprietors with no employees could use either an SSN or an EIN. Foreign entities required to pay taxes in the US may use a business EIN or an individual taxpayer ID number (ITIN) instead. A Social Security number (SSN) is a nine-digit number assigned by the Social Security Administration. An SSN is a tax ID and qualifies as a TIN. An SSN is used to track an individual’s lifetime earnings and to determine any Social Security benefits they may be eligible to receive. The first three digits of your SSN typically indicate an area, such as the state or US territory where the card was issued. The last four digits are often used for verification purposes. Only US citizens and immigrants with work authorization can get an SSN, according to the Social Security Administration (SSA). An EIN is a type of TIN that’s made public, which is why even sole proprietors should consider using an EIN instead of their personal SSN. Unlike a Social Security card, the EIN will be delivered in a letter from the IRS. Foreign businesses doing work in the US can obtain a federal Employer Tax ID Number (EIN) to use as their TIN, similar to any US business. However, individual taxpayers outside the US are not able to obtain a Social Security number, as they are not eligible for Social Security benefits. They would therefore need to obtain an Individual Taxpayer Identification Number (ITIN) from the IRS instead. You can’t apply for a TIN directly. Instead, you have to apply for one of the identification numbers that a TIN refers to, such as an SSN, EIN, or ITIN. SSNs are provided by the Social Security Administration and EINs and ITINs are provided by the IRS. Each type of TIN has its own application process and requirements as shown below. If you’re a US citizen, you probably already have a Social Security number. In fact, parents often apply for an infant’s SSN before they leave the hospital in order to be able to claim the child on their tax return. 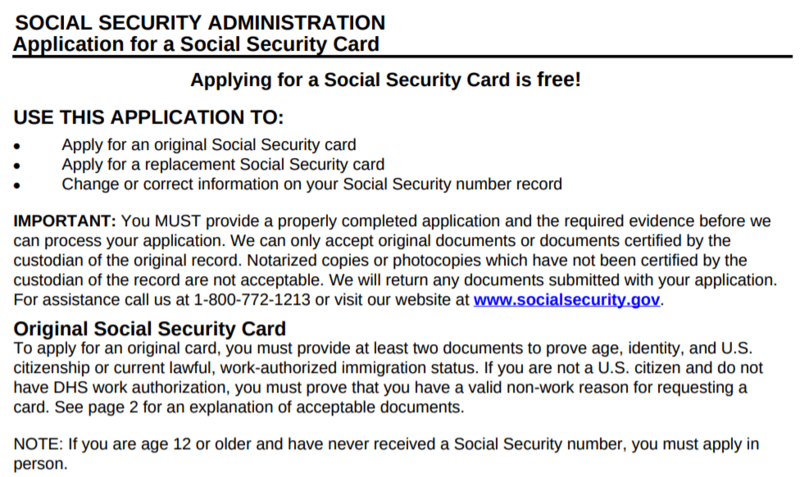 If you are a US citizen or are authorized to work in the US, you can apply for an SSN online on the SSA website or use IRS SS-5 application form. If you are over the age of 12 years, you must apply for an SSN in person. To apply, you must provide two documents that prove your age, identity, US citizenship, or your US work authorization as described on the application form above. An EIN is also referred to as a Federal Employer Tax ID Number (FEIN). You can apply for your EIN on the IRS.gov website or by using IRS form SS-4. You’ll receive your EIN after submitting the form along with proper documentation. For more information on EIN, read our complete article on what an EIN is and how to get one. If you don’t have an SSN and you’re not an employer using an EIN, you can still take advantage of tax exemptions in the US with an ITIN. The IRS provides an Interactive Tax Assistant to help you figure out whether you can use an existing ID or if you need to request an ITIN instead. The ITIN application form is called a W-7. Similar to an EIN, the form can be completed and submitted online. In general, a foreign business or non-resident alien doesn’t need to have a TIN to get paid. However, a TIN is required if a foreign business or entity wishes to claim a tax exemption from the US government’s Internal Revenue Service (IRS). In that case, a TIN is required as documentation so that the IRS knows how much the business or contractor earned, how much tax should be paid, or how many exemptions should be claimed. That is why many US businesses request a TIN from vendors and suppliers outside the US that they do business with. If you’re a business owner in the US, you probably already have a TIN. It’s your EIN. If you’re a sole proprietor, you can use your SSN for tax filings, similar to what employees do. However, if you want to take advantage of US tax exemptions and you’re a foreign entity or person, you’ll need a TIN—either an EIN, similar to any business in the US, or an ITIN for an individual outside the US. As a business owner, once you have a TIN, whether it be an EIN, SSN, or ITIN, you’re then able to apply for bank accounts and financing. We recommend Chase thanks to their large network of over 5,000 locations that allow you to walk in and ask questions about your business needs.